I’m working on a new quilt! This is such amazing news as it is the first quilt I’ve been able to share since the Double Rainbow quilt (which I finished back in April). I have one quilt out to a magazine, hopefully that will be published early next year. And I’ve been working on another one for a magazine, too. I can’t share those, so this is only the second quilt of 2014 that I can post photos of. Side note: I really have not quilted as much as I’d have liked this year. This is the Busy Bee Quilt Designs’ Victory Garden pattern. I’ve had it for a while now, and I decided that H needed a drag-around quilt for her tent downstairs. She is constantly stealing the couch quilts and taking them into her tent; she’s even taken a quilt right off of me. I thought this one would be perfect. 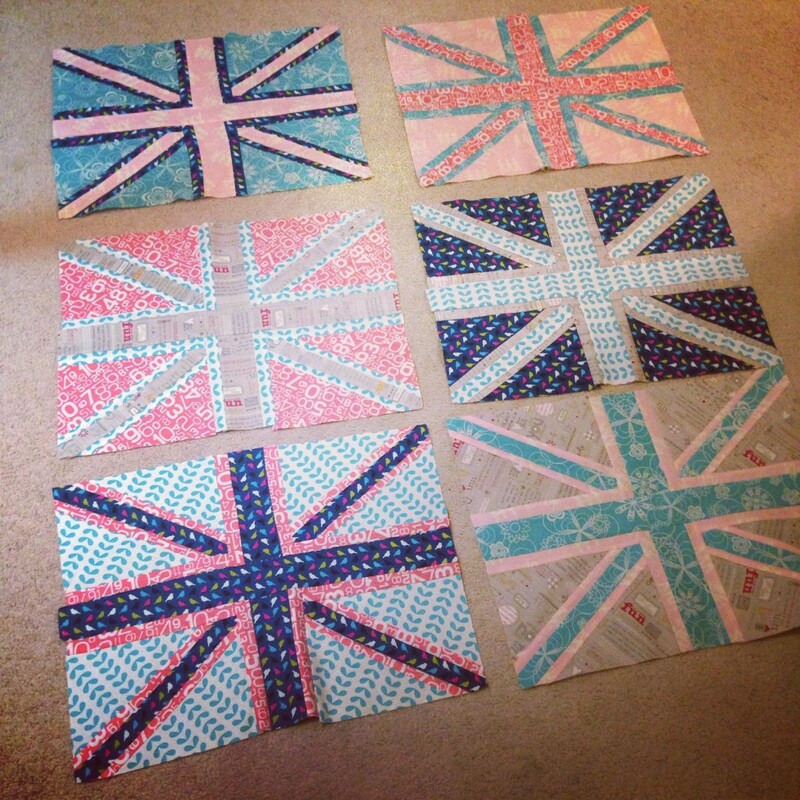 It’s like a mini-me version of Adam’s Union Jack quilt, but all pinks and blues. She loves pink, she loves color. And it will be a perfect size to drag around while she plays. 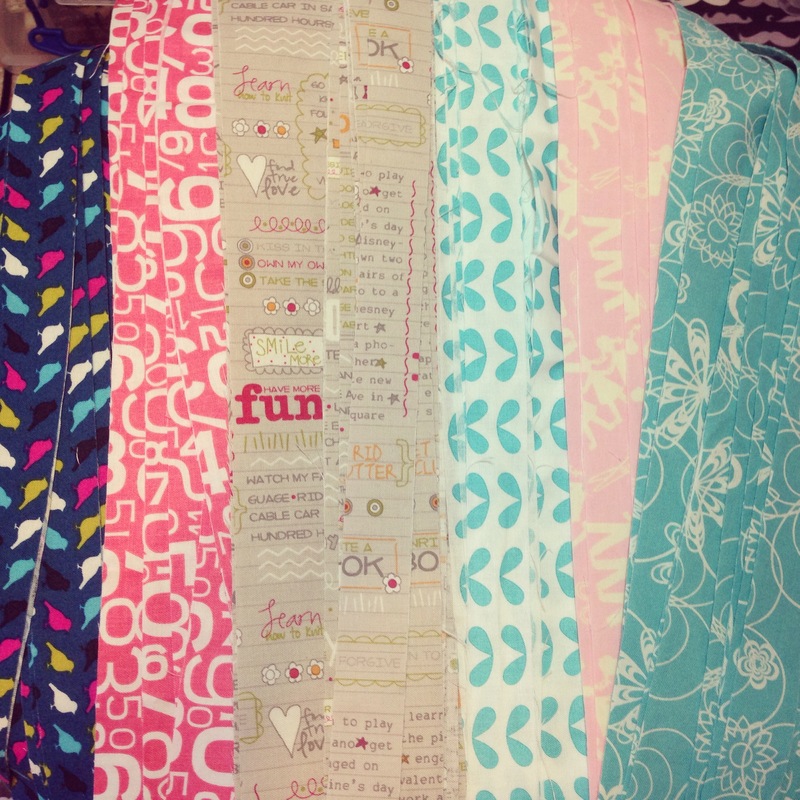 These are all fabrics from my stash. An Erin McMorris bird print, some Riley Blake Gracie Girls numbers (some of the other prints from that line are cornerstones on this top), Noteworthy by Moda, a white and aqua print from I don’t even know where, a paper people garland print (what do you actually call those garlands? ), and something from JoAnn that was in my stash. I love them, and I love that I’m using my stash after several years of being very matchy matchy with my quilts. This top is almost done, I’ve been finishing the border in between typing this. Then comes quilting and binding it. Soon!